Yesterday Craig Barnes, Attensa's CEO and Seth Goldstein, CEO of Root Markets, discussed their views on how applied attention technology works for users. 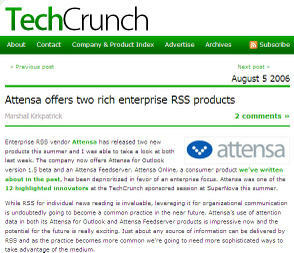 The Attensa approach is to use AttentionStreams to continuously and automatically prioritize information so that the most useful information bubbles to the top, helping to control the flow of the RSS information firehose. The Root Market approach is let user track their clickstreams on the Web and to use and share their history in a marketspace that trades qualified sales leads for offers of value. The Agile Buzz has the play by play here. And David Utter at WebProNews raises a valid question on the privacy concerns tied to an Attention based marketplace.